Achsah Goodwin Wilkins (1775-1853) was the daughter of William Goodwin of Lyde, a wealthy merchant in Baltimore. At age 18, Achsah became a member of the Methodist church, which caused difficulties with her Episcopal family. Two years later, she married William Wilkins, Jr., (1767-1832), who was also Methodist and a merchant. The family had a dry goods business and had been involved with the textile trade for many years. 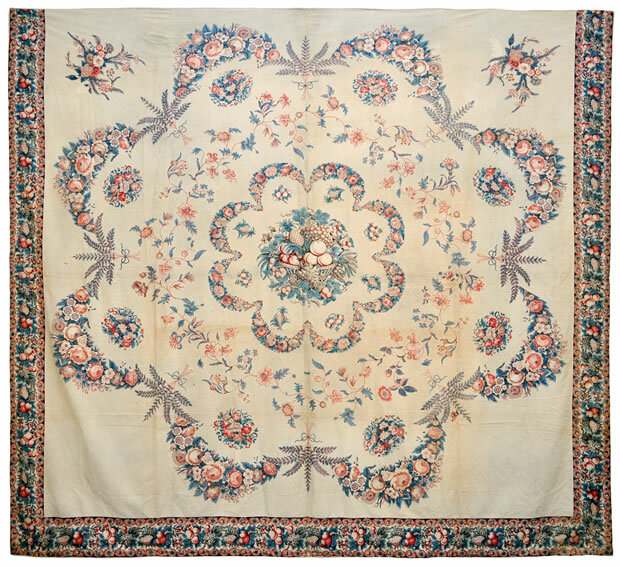 When Achsah was stricken with a cutaneous disease, causing her to lose use of her hands for a long period of time, she spent her weary hours designing fancy counterpanes by arranging pieces of cut out chintz on Marseilles cloth. Since she couldn’t sew, she enlisted the help of African-American women, quite possibly freed slaves living in her home and slaves of family members living close by. These women did all the sewing, and were an essential part of a most extraordinary collaborative effort. A number of the appliqué counterpanes surfaced in the 1940s, when occupational therapy pioneer and quilt collector Dr. William Rush Dunton documented them and included them in his seminal quilt history book, Old Quilts. Examples are held in collections at Colonial Williamsburg, the Smithsonian, and Andalusia. The counterpane at Colonial Williamsburg is currently on display in the “Quilts in the Baltimore Manner” exhibition at the DeWitt Wallace Decorative Arts Museum, which is on display through May 11, 2014. It was highlighted in a lecture about Achsah Goodwin Wilkins, presented by genealogist Ronda McAllen at a recent quilt conference in Williamsburg. Three months ago, I knew none of these things. I was visiting with a friend, talking about quilts, and I happened to mention how much I would like to find a Broderie Perse quilt to add to the collection. Afterwards, I sat down at the computer and there was a series of auction alerts in my e-mail box. I don’t always look at all the alerts, but this time I did. There was a Broderie Perse bedspread up for auction, and the auction was underway. I wasn’t sure if I could sign up for an auction in progress, but I tried, and it worked. Forty-five minutes later, the lot came up. Bidding wasn’t especially spirited. After a few moments, the bidding abruptly stopped, and I hadn’t reached my limit. I had only hoped to get a decent example of appliquéd cut out chintz to share in lectures, but as I’d soon find out, I was getting so much more. That day, I posted pictures from the auction on my blog, and later that week received an e-mail from Merikay Waldvogel. She thought I’d found a quilt in Dr. Dunton’s book, and I thought, “Cool! (Who is Dr Dunton? )” I learned quickly. The Achsah Goodwin Wilkins appliqué counterpane is a rare and stunning object. It is over 9 x 10 feet, and the chintz appliqué was expertly done in miniscule, meticulous stitches. The ground is a single-layer Marseilles cloth with a raised pattern. Most impressive are the stems of the appliquéd floral vines, which are less than 1/4” wide. Although it was a previously undocumented example, the overall design matched two finished counterpanes documented by Dr. Dunton, which had descended in the Thompson and Lassotovitch branches of the Goodwin/Wilkins family tree. Plates 71 and 73 in Old Quilts show those two examples. 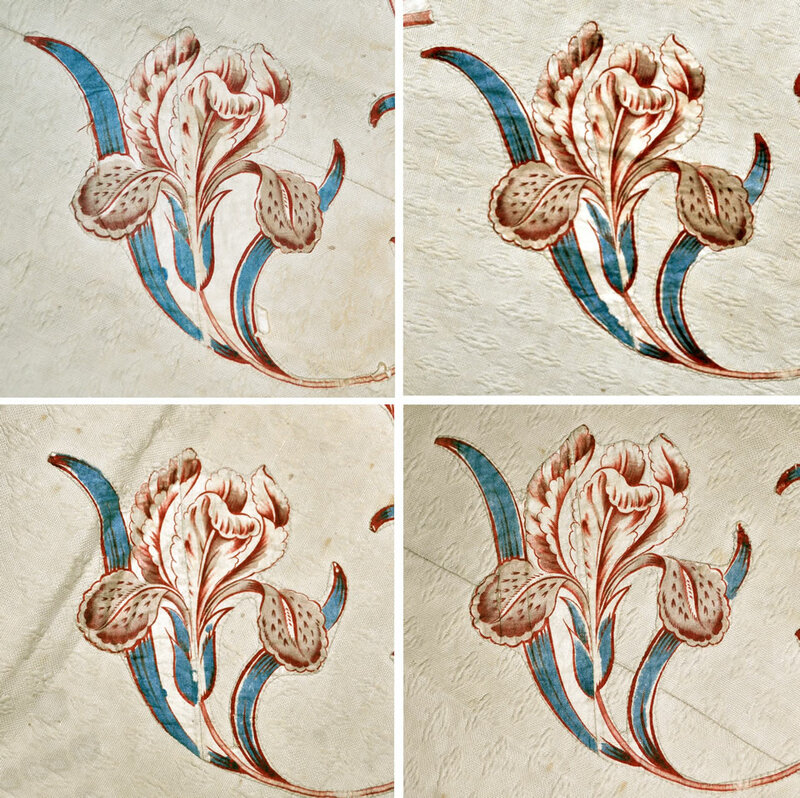 One of the common characteristics in all the counterpanes McAllen had seen is an iris, pieced together with two pieces of printed chintz, presumably from two sections of the flower found at different places on the edge of the print. There are four in the circle of vines on my counterpane. The weight of this important discovery hit me at the American Quilt Study Group Seminar in Lincoln, Nebraska, where it caused a big stir at the Show and Tell; and in Williamsburg, where I saw their counterpane showcased and learned an incredible amount from McAllen’s lecture. During the lecture, she showed the full view picture of my new discovery, and said a collector had recently found it at auction. All I could do was smile. Update, 1/10/2014: We got a word that this quilt will become a part of permanent quilt collection at the Daughters of American Revolution Museum (DAR). To find out more, please read this blog post from Bill’s personal blog.